We offer a 8-bed Mixed Dorm, a 10-bed Mixed Dorm and a 6-bed Female Dorm with private bathroom. All rooms are and secure and equipped with air-conditioning and a private locker for each guest. All guests can use the shared toilets and showers, which are newly renovated and will be cleaned daily. Enjoy your breakfast or relax with a cold beer on our bar. Feel free to use our kitchen for private cooking. 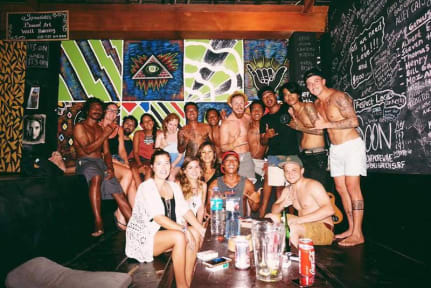 And meet new friends from all around the world at enjoy the view on Seminyak's last preserved ricefield.Our English-speaking staff will be more than happy to provide you more information about the island, scooter rental and airport transfer. Absolutely amazing hostel and staff. Just a beautiful family and a cosy hostel, clean with amazing atmosphere. Close to everything in Seminyak. 1000% recommend, thank you guys! Really good hostel. 10 minute walk to the center, 5 minutes walk to the beach. Not much to say about the place. It was fine for a short time, location was good and close to the beach. Communication with the staff is a bit hard because few of them just speak a bit English. Towels were free to use and beds were comfortable. Good location and helpful staff when checking in late at night. Only downside is the loud building work going on early morning. Good apart from the rats, squeaky beds and bed bugs, having my room changed mid stay for no reason, poor english from staff, mosquitos, wall socket not working, wifi not working. But hey 80000 a night and I slept well in a good location so cheers! When we arrived the guy that checked us in had no idea what he was doing. Couldn’t figure out our money and only had one towel for the two of us. Door lock was broken so we had trouble getting in and out the room. Apart from that, good location, not too far from beach, nice private beds, pretty standard facilities for a hostel on an island. Not bad for a couple nights stay.